There are few times when a handbag will not only catch my eye, but actually leave me sighing for it hours after I've passed it by. Okay, so that's never happened before, but it did while A. and I were aimlessly walking around Barcelona's Gothic quarter. The shop's window display stopped me in my tracks, but, alas, I found my dream messenger bag too late. It was our last night in the city and the shop was closing for the day. "Do you have a website?" I asked the lady as she pulled down the gates. "No," she replied. When I asked who made the pretty brown bag in the window all she could remember was that it was a London-based designer. Wonderful. So A. took a photo to submit to the Internet gods while I took note of the tags on the products around it as the bag's own was hidden. "Paper Plane" is all I had to go off of and for the rest of our walk that evening I lamented that I'd missed my chance to get the one souvenir I would have wanted. But because the Internet rocks, A. found the bag for me within minutes of getting online and I soon had a few shop sites that carried Disaster Designs' products and its Paper Plane line. Unfortunately, none where we were or where we were going to be so I decided to order it online. People, I even considered having it shipped to our Airbnb stay in Rome so I could have it before I left Europe, that's how much I was beasting for this thing (I didn't risk it though). Instead, I bought the satchel handbag from Bloomsbury & Co., a British shop that ships internationally, and had it delivered home. It didn't arrive until a week after I returned, but I was so happy once it was finally mine. I love the size, the faux leather color that's already showing a bit of wear quite nicely, and the pink vintage map printed on the front (though I slightly wish it were a vintage city map rather than a topographic one). It also features what I wished my Timbuk2 messenger bag had: buckles! And the whimsical little accents - from the red luggage tag with the words "travel in style" pressed onto it, the airmail-style piping along the flap's edges, and the "Return to Sender" stitched across the front - all cater to this travel writer who still likes to pen her letters by hand. The back is the same brown with the blue-and-white striped ribbons continuing all the way down and a tiny tag with an enveloped sealed with a loving kiss. 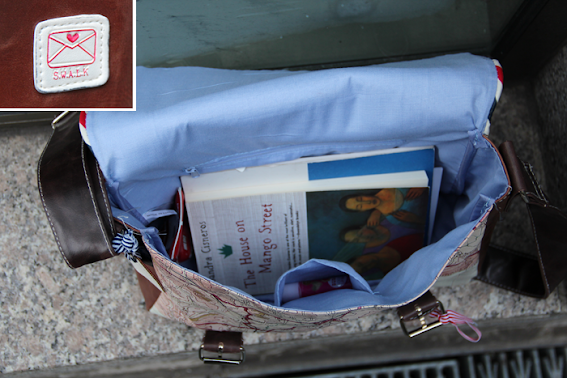 The interior is a simple light blue fabric, which makes it easy to find things inside, with a zippered pocket and pouch. My only concern after purchasing it was whether my new 13-inch MacBook Pro would fit in it as nicely as it does in my Timbuk2 messenger bag. It's a tighter fit, but it fits nonetheless! I'm really enjoying carrying my quirky bag around town, the fun story it comes with, and the fact that I doubt I'll ever encounter another person with it. Maybe it's for the best that the UK's Amazon site won't ship to the U.S. because all this Paper Plane cuteness would just ruin me. OH MY GOSH, I really really want that bag!!!!! Holy moly, I'm in love with that bag. I bough a kinda sorta similar one on ebay...you know, for really cheap, and you get what you pay for because the faux leather strap totally snapped on me :( Beautiful find! I am coveting that bag. oh, i want this bag. and i see "house on mango street" peeking inside..i love that book! so simple yet so touching. and we also love the house on mango street!